When you look at Zen Studios, they have been known for making pinball machine simulations. While these machines were their own creations, they felt like they were actual machines that had been remastered for a new generation. The accuracy of the ball movement and the flow of the action made Zen Studios the best pinball studio. When I found out about KickBeat, I thought that the concept was interesting. When I heard that Zen Studios was behind it, I had my doubts they could really pull it off. 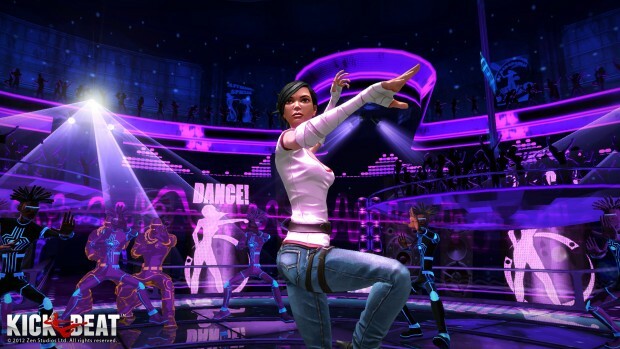 While most gamers are familiar with Rock Band and Guitar Hero, with the scrolling notes going from the top of the screen to the bottom of the screen, KickBeat feels more like the rhythm game Dance Dance Revolution. However, instead of having arrows scroll from the bottom to the top, your character stands in the middle of a circle. The face button press required to hit the target is illuminated and gets brighter as it gets closer to the time to be hit. The face buttons act as the directions for where your attacks move. [singlepic id=15774 w=320 h=240 float=left]In Kick Beat, you are a member of the Order of the Melodic Fist, being trained to protect the Sphere of Music which contains every song ever in existence, whether past, present, or future. One evening the evil giant conglomerate Entertainment Earth has stolen all the songs from the Sphere of Music…even Justin Bieber!!! You are now on the path to rescue the earth’s songs so that music can be enjoyed by everyone. If you’ve seen any kind of martial arts movie, then you have probably seen a scene where the champion stands in the center of a group while they fight him one by one. In KickBeat, when you enter the stage you can see the mob ready to attack. Enemies move counter-clockwise around you until they move into the designated area where they can be hit. A white outline surrounds the enemy next in line to get karate chopped. While all of this sounds like a fighting game, the music drives the action. Attacking requires timing that follows the music. If you just try to hit buttons wildly, your character gets exhausted and becomes vulnerable to attacks. In the earlier difficulty levels, the attacks coincide with the beat of the music, but in higher difficulties they will match the vocals or some other instrument of the music. This helps the replayability and makes playing through the higher difficulty levels more than just more enemies or pressing buttons faster. Three different kinds of enemies attack you based on their colors. The yellow enemies attack one at a time and are always on the beat. Blue ones approach you in rapid succession, hitting you on the off-beat as well as on the beat. The red targets attack on the beat, but attack two at a time, requiring two buttons to be pressed at the same time to defeat both. Worrying about which enemy comes and from where is only a part of the gameplay. Some enemies glow requiring a you to press the required button, holding it down, and releasing when the connected enemy steps into the attack. Also orbs can be hovering over attackers. These orbs can give you extra health, extra chi, bonus points, increase the multiplier, eliminate close enemies with a shock wave, or give you an invulnerability shield for a little while. To gain them, you have to hit the corresponding button twice. Sometimes getting the shield or extra health can be the difference between making it to the end of the song and not completing it. However, health orbs won’t show up on the two highest difficulties. Under your character in the center a yin yang symbol shows your health and your chi. Your health depletes when you are hit, and once you get down to zero the stage ends. The chi builds up over time by defeating attackers and collecting chi orbs. When this indicator is full you can activate Chi mode which doubles your multiplier. [singlepic id=15777 w=320 h=240 float=right]After you complete a stage you are shown the number of blue, yellow, and red enemies you defeated during the song. However, getting a high score is difficult with all the action going on, at least until you have played it for a while. I highly recommend starting on the easiest level, and don’t be surprised if you end up with two out of five starts when you start playing. It will take time and practice to get higher scores and build up your chi to double your multiplier at the right time. Kick Beat is unique in that instead of using arrows or symbols it uses human enemies to show when to hit your buttons. All of the characters in the game were hand-drawn, and the painstaking process has paid off. Whether using their hands to decommission an enemy, or standing on their hands and then swinging the legs to hit two targets at the same time, the fluid animations of the two different characters you can play as look lifelike. Each category of enemies looks exactly the same in the stage, but they match the background. In the training arena, ninjas surround you. When you find yourself in a wrestling ring, masked characters come after you. These are subtle changes, but it is nice to see that the characters you are fighting against aren’t just a palate swap. The biggest problem with all of the action is seeing all the upcoming enemies, especially on a screen the size of that on the Vita. I would be remiss if I didn’t mention some of the 18 songs included. They lean towards the heavier side with artists including P.O.D., Marilyn Manson, Rob Zombie, and Celldweller. The most unique track is the one from Shen Yi, a Taiwanese rapper. The music included works well, though I had a difficult time hearing the beat during portions of The Beautiful People. If you don’t like the included songs, you can actually import MP3 files into the game. You do need to be certain that you use songs that have a consistent beat for the best results though. I played Elite Beat Agents through two difficulty levels, something that is rare for me with any game. I can see myself doing that with KickBeat as well. Zen Studios showed that they can branch out to new genres and produce a quality game without flippers. If you’ve wished that you could find a music game with heavier beats and harder vocals, then the music in Kick Beat should be right up your alley. I have to say that I was pleasantly surprised by how well it turned out. For only $10, you’ll get plenty of gameplay for the money spent.